If you haven’t been following John’s excellent series on Masculine Grooming here on the site, you’re really missing out. He does a great job of breaking down the importance of having a solid grooming routine in a way that I hope has become expected with the other content of the site – mainly by giving us a little bit of history, psychology, and how-to all thrown in together. Part of dialing in a grooming practice is using proper tools. While that does include the heavy hitters like razors and trips to the barber, it also consists of a daily dose of lotions, oils, and powders. It’s funny, I struggled typing out that last sentence because every iteration I came up with sounded soft, girly, and a bit dainty. If you feel that way at all about the necessity of grooming, seriously go read John’s series before getting deeper into this post. After digging through John’s posts I realized my daily ritual was seriously lacking. I (like most of the civilized world) was already in the habit of daily showers, teeth brushing, and other minimal cleaning efforts, but I was not one to use lotions, powders, or oils. In fact, other than a beard oil and some pomade, I wasn’t using much beyond the typical shampoo, conditioner, and body soap. A few months back I was introduced to one of the founders of a site called Grooming Lounge. After a few emails and a quick phone call, we agreed on their sending me a few products in exchange for a review. They were big fans of the beard and so beard care products are what they sent. One of the cool things about Grooming Lounge is the mix of other brand’s products along with their own. The package they originally sent me consisted entirely of other brand’s offerings. In it were a shampoo, conditioner, and lotion from Blue Beard, a scruff and goatee softener from Soft Goat, and a jar of beard oil from Beard Brand. In full disclosure, I have not used the Soft Goat product. The other products have kept my beard soft enough and I wear it long enough, that I haven’t seen the need to yet. Everything else has been great though. Some will argue that using beard specific shampoos and conditioners is unnecessary. However, after learning how different beard hair is from both head and body hair, along with how different the skin on a man’s face is from that on the rest of his body, it makes sense that beard care should require different products. What I’ve found is that the use of these items has kept my beard cleaner, softer, easier to maintain, and a whole lot less itchy. After about six weeks of using the contents of the first package, I had the opportunity to meet both founders of Grooming Lounge at StyleCon in Atlanta. While we were there they followed up on how I was liking what they sent, and they gave me a few more goodies to try out. This time around though, everything they gave me was a product that they’ve developed and produced under their own brand. Unlike the beard-specific items from before, this kit consists mostly of shave and skin care. Maintaining the full disclosure, I haven’t yet used their “Shavior” razor burn treatment oil. Mostly it’s because I use a single-blade safety razor and haven’t experienced razor burn in years. The rest of their lineup has made its way nicely into my daily and weekly routine though. The two products I now use daily are the Mug Moisturizer and Super Powder. The former is a lotion that helps keep dry areas softer and more flexible, while the latter is a body powder which keeps moist areas dryer and more breathable. While I do keep a beard and have done so for nearly ten years now, I – for the most part – insist on keeping it crisp and sharp. For me this means a weekly shave every Sunday. I do a quick clean up on both my neck and cheeks, along with using a beard trimmer to make sure everything is nice and organized. In the past, I’ve been happy to use drug-store products as both shave cream and after shave, but Grooming Lounge has helped me make the transition to using higher quality goods. I’ll admit that the first time I used their shave lineup I was a bit skeptical. I thought using a a pre-shave oil was superfluous, a non-lathering cream was inferior, and a more expensive after shave was unnecessary. I was wrong on all three counts. The closeness of my shaves is better than it’s ever been. My already minimal skin irritation is almost completely eradicated, and the balance between sharp and cool of a higher-grade after shave keeps my pores closed and feels great. All of these products have an incredible, masculine smell to them that makes the process more enjoyable as well. 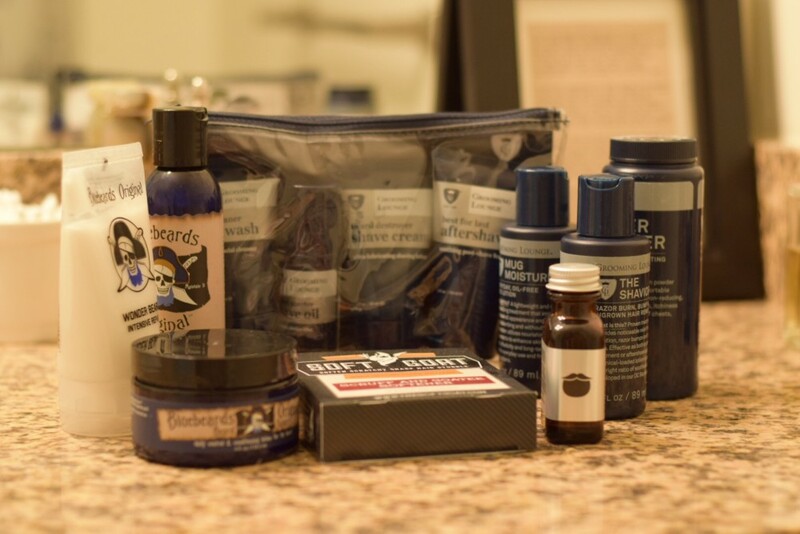 While the pre-shave oil and after shave are now a part of my weekly routine, I’ve decided to keep their shaving cream as part of my travel and dopp kit. The reason’s for this are three-fold. First, the difference in the quality of my shave between using Grooming Lounge’s shaving cream vs my current was minimal. Secondly, having a non-lather shaving cream is significantly easier for travel. It doesn’t require a brush or mug and helps me keep things light. Third, I genuinely enjoy the weekly routine of using a mug and brush to create a heavy lather for my shaving. It’s cathartic and not something I want to give up when the results are just as good. As Grooming Lounge continues to expand their offerings, both in the other brands they carry and the products they create themselves, I’m excited to see them continue with the same level of quality they’ve demonstrated thus far.